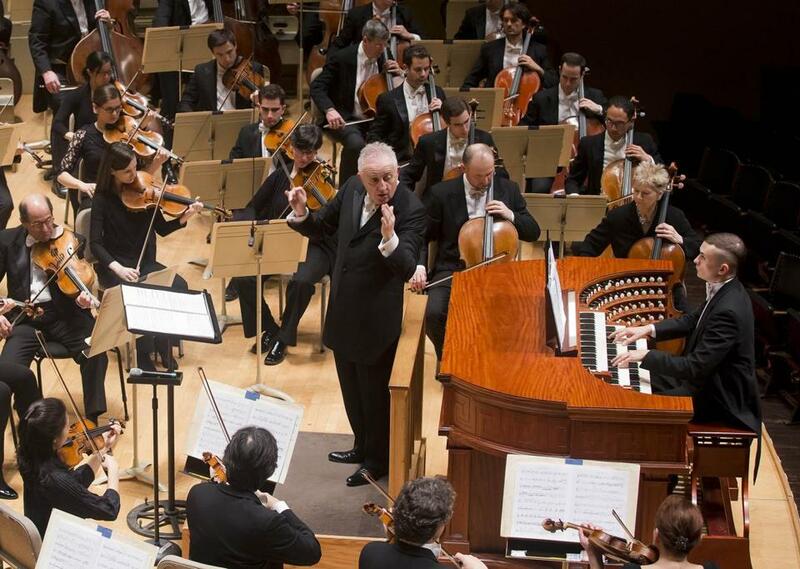 Bramwell Tovey conducts organist Cameron Carpenter and the Boston Symphony Orchestra at Symphony Hall Thursday night. The pastiche of phrases here was at times unfocused, timbre and theme sometimes melting into indistinguishable ether, but Carpenter’s control of his instrument was unmatched. He played with subtle changes in register and volume, holding back the full potential, so when he (literally) pulled out all the stops, we truly felt it. After our bones had been rattled, the piece faded away with a hum from one keyboard and a warble from another, quiet enough to hear a cough drop unwrap across the hall. Of course, this was followed by some of Carpenter’s calling-card encores, his own zooming arrangement of the Gigue from Bach’s French Suite No. 5 and a joyous, goofy “Fly Me to the Moon.” The man doesn’t end a star turn with subtle.